Welcome to Fishketchikan.com. We offer fully guided Alaska Salmon fishing charters and Alaska halibut fishing charters departing from Ketchikan Alaska. 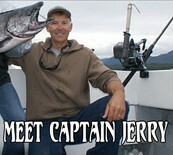 Captain Jerry says” I guarantee we will catch fish”. We cater to the experienced and novice angler alike. Our fast, specialized, Ketchikan fishing charter boat allows you more fishing time than the other boats! Alaska Cruise Ship Passengers Are Our Specialty. We will pick you up at your Alaska cruise ship with a sign with your name on it! We provide a very personal and exclusive Ketchikan Alaska fishing experience. Our fishing charter boat will be waiting near your cruise ship ready for you to depart immediately to the Ketchikan Alaska fishing grounds. All your gear is provided. You need no skills to be successful at Alaska salmon fishing or Alaska halibut fishing. The above rates are per person. Sales tax is included in price. boats take up to six passengers by Coast Guard regulation. Group discount: groups of 6 pay only 125.00 per person. * DELIVERY OF YOUR ALASKA FISH (IF DESIRED) TO THE PROCESSER. * 50% DEPOSIT IS REQUIRED TO BOOK, CREDIT CARDS ACCEPTED. * BALANCE CAN BE PAID THE DAY OF THE CHARTER. * DEPOSIT REFUNDED IF CHARTER IS CANCELLED BY THE SKIPPER. * DEPOSIT REFUNDED IF YOU CANCEL 30 DAYS PRIOR TO CHARTER. Experience a more personal Ketchikan Alaska experience than what is sold through the cruise ship and save money at the same time! We often see whales, bald eagles, seals, sea lions and porpoises while catching Alaska salmon and Alaska halibut! Captain Jerry was a very professional guide. Everything was top notch and as he promised when we made our reservation. We caught Salmon non-stop and had the trip of a lifetime. Thanks Jerry!